It's finally time for your braces to come off. Your teeth are straight and beautiful at last, but you're not finished yet! Impressions will be taken for study models and working casts for your new retainers. Retainers are designed to hold your teeth in place while they settle into their final position. Depending on your case the doctor will make recommendations on how long you need to wear your retainers each day and for how many months, years, and sometimes for life! Your doctor will fill out a prescription slip with instructions for the type of retainer and the specific design he/she wants the lab technician to follow when making your appliances. Some doctors have a technician in their office but in most cases your appliances will be sent out to an orthodontic laboratory to be fabricated. Our lab is Harris Orthodontic Laboratory in California, and I have been bending wires and fabricating retainers for over 30 years. I've learned from many top notch orthodontists and dentists how to make retainers that fit properly and with the new colored acrylics we put designs in them that look really cool. Because lab technicians don't have a dental degree, we are not allowed to work directly on patients. For that reason we only work from a doctor's prescription slip. We also don't have the diagnostic information about you that the doctor has compiled and it would be a disservice to you for us to design or make appliances without this knowledge. Like the doctors, lab technicians are always learning and our ability to communicate new techniques and lab procedures to the doctors in their vernacular is one of our most important responsibilities. The doctor is responsible to you and we are responsible to the doctor. Before you receive your retainer be sure to visit my retainer website. You'll get tips on things to look forbefore you get your retainers. It also discusses how to take care of your appliances and keep track of them once you receive them. Ever wonder how Hawley retainers are made? Here's a slide showwhich shows the entire process! I make at least five replacement retainers a week. They seem to disappear quite easily if you don't make good habits. For example, put an attractive ceramic container with a lid on your dinner table so you'll always have a nice place to hide your retainer while you eat. Your friends and family will appreciate your consideration. 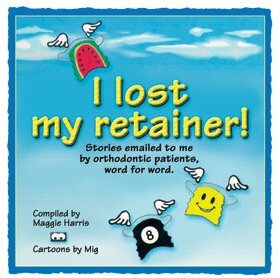 I compiled a book of lost retainer stories illustrated with cartoons that patients have emailed me over the years! Here is a link to my book of retainer stories. It makes a great gift for a friend (or as a final thank you gift for your orthodontist), or a fun waiting-room book for any dental professional. The most common story is "I wrapped it in a napkin and spent an hour dumpster diving to find it". Your pets also rank right at the top. They love the smell and like to chew them up. I think my favorite unusual story is Ashley's story. Ashley was making a S'mores, cooking her marshmallow on a stick over the campfire, when a friend called out her name. As she turned to see who it was, her stick with the marshmallow passed over the picnic table and picked up her retainer like a crane. You see, she set her retainer on the picnic table during dinner (mistake). Ashley turned back around to finish cooking the marshmallow and didn't notice that her retainer was stuck to it. You guessed it, the retainer melted and I don't think she used that marshmallow in her S'more! You're definitely not alone if you've lost your retainer. And yes, there is a retainer heaven. Visit us at http://www.myretainer.com. If you have retainer questions, email them to me! Remember to "make good habits" and you'll save time and money on costly repairs and remakes!